I seem to be buying lots of books lately and I'm also starting two at a time - one is always upstairs so when I do my nightly sitting on the door waiting for Bubba to go to sleep and the other is downstairs for when I get a few minutes to sit and read (not very often I might add). 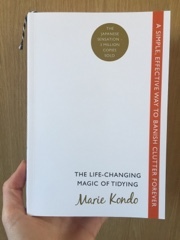 I had seen interviews with Marie Kondo in the national newspapers earlier in the year and resisted buying this book purely through my own laziness. I didn't want to have to feel compelled to tidy, I'm a working mother of two with a job on the side and two guinea pigs. I didn't need to tidy up aswell!! 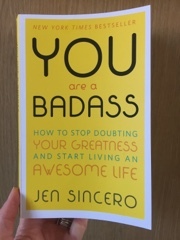 But my very wonderful best friend sent me an email and a picture of a jumper she had folded raving about this book. She mentioned how it was transforming the lives of her family and how she had cleared lots of her stuff out. Well I'm such a sheep and cannot live without the latest fad so quicker than quick I ordered this book. Already I'm slightly hooked, there is a lot of waffle at the beginning about how it will change your life so I get a bit restless with this (but I think that's more because I knew the folding bit was coming soon.) I must admit though it all makes sense and its easy to get hooked on this book, I have already tackled a couple of nightmare cupboards and the trick according to Marie is to sort categories rather than the worrying rubbish draw that everyone has. So I started with make up and technology and next I'm moving on to shoes and then clothes. Warning....it does get addictive and also look out for my folding pictures on Instagram (@bubbababble) when I get to clothes.